Visiting with Katie Pietrak is like getting caught in a whirlwind of retro realism. The owner of Vintage Vinyl Journals is a renaissance woman, with interests, talents and expertise that encompasses history, ecology of recycling, and apiary arts (bee keeping). Katie and her Dad, Tony recently launched IndianValleyHoney.com, an enterprise that they enjoy in their spare time. Although where they find spare time is a mystery. Tony is hand building the new family home, and Katie is racing to keep even with her large inventory of journals. Back to the Vintage Vinyl Journals Biz NESS. Katie is so proud of the green-ness of Vintage Vinyl Journals, the old favorite LPs are laser cut and hand polished, with fine acid free paper inserted, while the album cover is cut precisely to capture the spirit of the artist and intrigue the recipient. If you are a Carly, Janis, Jimmy or Bing fan, or love 70’s folk rock, Katie has a stash of journals to meet the desire of every music lover. She will even custom make journals using current musicians and bands as promotional tools. They are amazing in person, a touch of classic and blend of nostalgia. Journaling goes back through the ages, for diarists, musicians, creatives of every school, and whether the journal is a personal purchase or a gift, each one is hand built, finished and packaged. VVJ is attending the Philadelphia Folksong Society Festival this year as just one of their craft and trade show events. The preparation for this type of event spans so much more than making sure the product is ready. Starting with 300 journals, with the ability to replace those daily for the duration of the show, the necessary staging, lights, tents, tables and displays are worthy of a team of roadies. 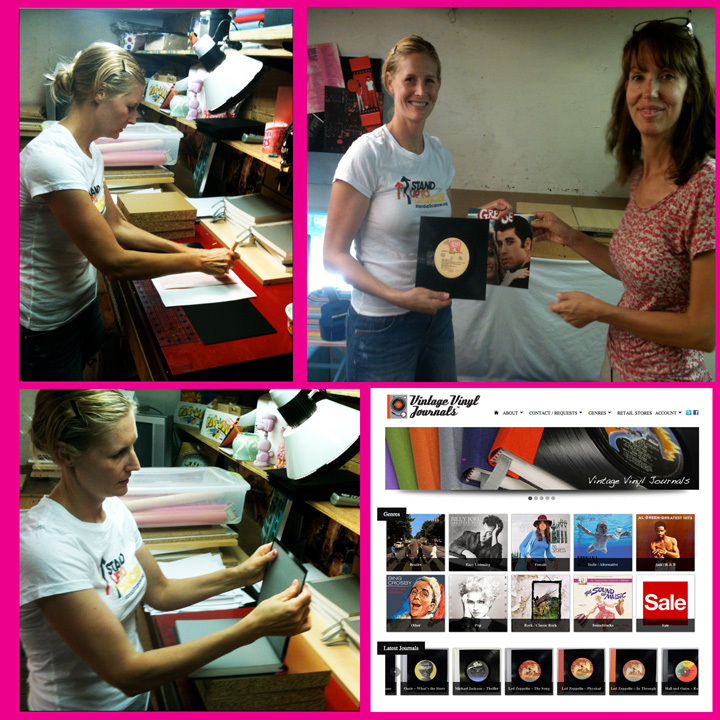 Vintage Vinyl Journals are featured both online and in select retail shops, she wouldn’t mind a few more contacts.